Get ready to pin to win! Brides of North Texas is excited to kick off our first official Pinterest wedding style contest open to all of our fans and followers – the contest is literally open to anyone who loves weddings! So, spread the word! Here’s the scoop… All you have to do is create a board on Pinterest titled “Brides of North Texas” and share your personal wedding style by pinning a few of your favorite wedding images found on www.bridesofnorthtexas.com in our wedding galleries. We’ve categorized one beautiful Texas wedding after another by color, style or type of venue to make it easy for you to find looks you love. 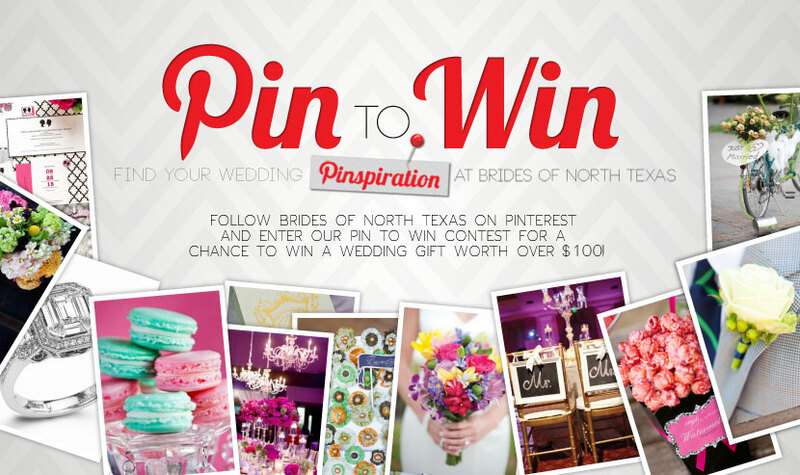 Use the “Pin It” button on our site to pin images you love to the Brides of North Texas board you create. Then, be sure to tag each image with “#BridesofNTX” in the pin description. Once your wedding board is complete, shoot it over to us by simply filling out our online form. The contest runs through the end of the month and we’ll announce the lucky winner who grabs our attention on June 4. The winner receives a wedding gift worth over $100! So, go ahead and get started! Pin away and let the sharing begin! We can’t wait to see your beautiful boards! For the complete official rules, be sure to check out our Pin to Win Contest page. Cheers! « Previous Post: Check Out Our Recent, Favorite Pins on Pinterest!